The share of pupils in England's schools speaking English as a second language has risen to a record high, government figures show. Some 14.4% of primary school pupils spoke a language other than English as their first language in 2008 - a rise of 0.9 percentage points on 2007. It was 10.5% in 2004, the year before the main European Union expansion, and has almost doubled since 1997. In secondary schools, the proportion rose from 10.6% to 10.8% over 2007-08. The latest figures translate to some 470,080 pupils in primary schools and 354,300 pupils in secondary schools whose first language is thought not to be English. But many of these pupils are likely to be concentrated in certain areas, such as inner London where 53.4% of pupils do not speak English as a first language. The increase is part of a sharply rising trend, likely to reflect the growing number of children from migrant families often from eastern European countries. Teachers say helping children who do not speak English as their mother tongue places extra demands on schools. The Association of Teachers and Lecturers has called for extra funding to help them cope with the numbers of children arriving from abroad with little or no English. And some local authorities with high numbers of recent immigrants have been calling for emergency funds to help them respond to any extra demands on education and other services. Schools minister Jim Knight said: "We know this is an issue for some areas and schools - that¿s why we give those areas ringfenced funding and support to deal with it. "But the facts are clear overall - there are record amounts being invested in schools, with the most teachers for a generation and the most teaching assistants ever. "The evidence is clear that children with English as a second language make exceptional progress and are rapidly closing the gap with native speakers." Liberal Democrat Leader Nick Clegg said rising migration was putting pressure on schools at all levels. The figures also show that there is a slightly larger percentage of ethnic minority pupils in both primary and secondary schools. It increased from 21.9% in 2007 to 23.3% in 2008. There is a similar trend in secondary schools with the figures rising from 18% to 19.5% over the same period. 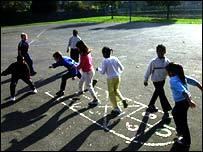 The biggest ethnic minority group is Asian with 8.9% of primary school pupils and 7.4% of secondary pupils. Some 4.8% of primary pupils were classified as black and 4.1% of secondary pupils. But white pupils still dominate, and represent 80% of primary pupils and 82.5% of secondary pupils in England overall. There will, however be huge regional variations with more ethnic minorities concentrated in urban centres like London.